Hot Bread Kitchen. 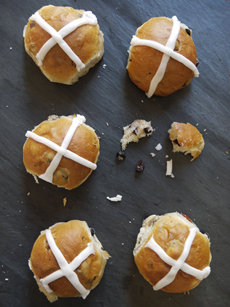 With Easter a week away, you can start baking the seasonal treat, hot cross buns. The first recorded use of the term “hot cross bun” appears in 1733. A sweet yeast bun made with raisins or currants, the cross on top was originally made with knife cuts in the dough. Over time, icing was piped over the cuts. The cross symbolizes the crucifixion, and the buns are traditionally eaten on Good Friday. Actually, they are believed to predate Christianity: Similar buns were eaten by Saxons in to honor Eostre, the goddess of spring. In their ancient pagan culture, the cross is believed to have symbolized the four quarters of the moon. Eostre is probably the origin of “Easter.” Many pagan holidays were ported into Christianity in its early days, to encourage pagans to convert to the new faith. 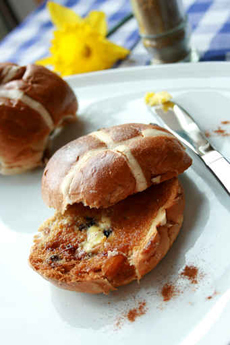 You don’t have to wait for Good Friday to enjoy hot cross buns. They’re too delicious to save for one day of the year. While Good Friday—this year, April 3rd—is National Hot Cross Bun Day, we’re giving you the heads up. If you don’t celebrate Easter, go back to the roots of this recipe and celebrate spring! This recipe, from the California Raisin Marketing Board, adds a twist to the traditional recipe: The icing is flavored with lemon, adding a tart counterpoint to the straight sweetness. 1. SCALD the milk, stir in the butter and cool the mixture to lukewarm. Dissolve the yeast in warm water. 2. SIFT together the flour, sugar, salt and cinnamon in a large bowl. Stir in the raisins until well coated. Stir in the eggs and the cooled milk and yeast; blend well. 3. TURN the dough out onto a lightly floured board and knead until smooth and elastic, 5 to 8 minutes. Place in a greased bowl, turning to grease the top. Cover and let the dough rise in a warm place until it has doubled in bulk, about 1-1/2 hours. 4. PUNCH down the dough, pinch off pieces and form smooth, round balls about 1-1/2 inches in diameter. Place the balls of dough on a greased baking sheet about 2-inches apart. Brush each bun with the diluted egg yolk. Cut a 1/2-inch deep cross in the center of each bun with a greased scissors. Let the buns rise in a warm place until doubled in bulk, about 30 minutes. While the buns are rising, preheat the oven to 400°F. 5. BAKE for 8 to 10 minutes or until the buns look lightly browned. Cool on wire racks, about 5 minutes. 6. MAKE the icing: Combine the ingredients and beat until smooth. Pipe the icing to make a cross on each bun. If you want to enjoy the hot cross buns as toast, leave off the icing. Photo © Woodsy | Fotolia.